ARM or Age Related Macular Degeneration, is a leading form of blindness in Australia affecting mainly older people. It results from age related changes affecting the macula, or the central part of the retina .This region is responsible for giving us fine detailed vision. It is the targeting part of our visual system. The exact causes are difficult to understand. The postulations are that free radicals and compromised microcirculation lead to changes in retinal pigment epithelium which in turn leads to macular degeneration. Genetical factors are slowly being implicated. How is my vision affected? In early stages the visual defects are very subtle, you may miss few letters in a passage, have a micro blotch in front of your eyes. You may have difficulty resolving small detail when reading. Later the effect may be more pronounced, accompanied by difficulty in recognizing faces, distortion of contour, changes in colour vision. Again in very early stages it is very difficult to pick these changes up, as the brain tries to fill in the blanks in an attempt to overcome the handicap. These are based on the broad type of ARM .The types breakdown into DRY and WET forms. In the more aggressive WET types of the condition, treatment protocols are offered on the basis of severity. Anti-Vaso-Endothelial Growth Factors, or endothelial growth factor inhibitors, anti-VEGF for short. Two drugs available are Lucentis ,Avastin and recently Eyelea These drugs, are injected directly into the eye, in an attempt to reduce swelling of the retina by inhibiting new vessel growth into and around the degenerating retinal tissue. Photodynamic therapy, utilizes a non-thermal laser to activate a light sensitive drug Visudyne. This drug previously injected into the bloodstream reaches the retina where it becomes activated . 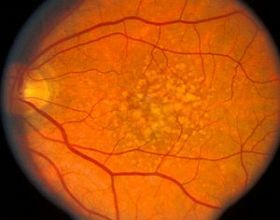 The activated drug cauterizes leaky blood vessels around the region where macular degeneration is occurring reducing the risk of further retinal tissue damage. It spares damage to normal surrounding tissue. Laser photocoagulation, is a non selective treatment aimed at sealing leaky blood vessels, drying up the area at the site of degeneration. It is the leaky vessels which cause most damage during wet ARM .By definition it does not differentiate between healthy and leaky vessels, hence causes more collateral damage of adjacent tissue. It is not unusual to attain a blind spot from the procedure. The benefits of this treatment are realized slowly up to even two years after the procedure. The combined benefits of treatments with laser and anti-VEGF are well documented. Vaso-endothelial growth factor blockers. Whilst these are smaller molecules than Avastin and Lucentis, are believed to perform similar action to anti-VEGF. They will soon become available. In the dry type of ARM, there are no current effective treatments, but in pharmacology new drugs are in the pipeline. Advice offered is along the lines of a healthy lifestyle. Maintain a healthy outlook, by exercising and eating green leafy vegetables, fruits, nuts, beans. Fruits and vegetables provide us with vitamins, anti-oxidants and trace elements which have been shown to have some marginal benefit in very early stages of the disease. Various visual aid systems can be offered to assist visually impaired. As management of macular degeneration is continuously evolving, please discuss any concern with our optometrist and we will advise you on the best course of action, and if in need of treatment send you to surgeons with best proven outcomes. We strongly endorse retinal imaging as part of you general ocular health check. High resolution imaging is beneficial,as is archiving capability.Talk to our assistants.